It’s that time of year again, when every time I go down to the garden I come back with a pocket full of seeds. I’m going to take a slightly different approach this year to what I usually do. I normally wait until I have got all the year’s seeds in, then make up my trade list. The trouble with this is that by the time the last seeds are ready, the earliest ones have been in store for over six months and in some cases have already missed their ideal sowing time, so this year I am simply going to list seeds as I pick them. One of my motivations for seed saving is that I find a lot of species, especially those in the carrot family, difficult to grow from bought seed. This applies not only to forest garden exotics but to well established crops like parsnips. I know I’m not the only one and I’m convinced that this is the reason why some crops like turnip-rooted chervil and Hamburg parsley aren’t more popular, despite how delicious they are. I’m hoping that this approach will help other people around that barrier. My seeds are listed on the Forest Garden Seeds page. Forest gardening draws on the way in which nature itself works for many things, from fertility to pest control. Therefore, when it comes to pruning, you might imagine that it would be best to leave aside such artificial practices and instead let trees and shrubs follow their own natural patterns of development. No-work permaculture at its finest! This was my own assumption when I started forest gardening, but years of experience have taught me, often the hard way, that the opposite is true. Pruning is a very effective intervention that pays back the effort many times in terms of the accessibility, quality and size of your crops. It is also a great way of learning more about your plants and how they develop. With a little practice, you can use your secateurs as a baton to conduct a symphony of growth, flowering and fruiting in your garden. I use pruning to achieve three main things. The first is access. The secret to a forest garden in its complex, multi-layered structure. This can also be a hazard as you battle your way through branches and wet foliage to get to your food or get poked in the eye bending down to pick from the ground layer. The main principle here is to prevent plants from branching too low down so that you have a clear view and easy access to the plants growing beneath them. You can also make trees and shrubs more robust and so less likely to be dragged down by the weight of their own fruit. The second is yield. Pruning is your main method for persuading trees to put more energy into fruiting and less into massive amounts of woody growth. It largely isn’t a matter of cutting off growth after it has happened but instead of cutting back to the right buds so that you encourage the kind of growth that will bear fruit. A tree that is investing less in vertical growth will have more to put into fruit and the lighter, sunnier canopy will generally allow better ripening of the fruit. In a forest garden, there is also a knock-on effect in the lower layers. Many plants naturally produce more foliage than they strictly need for photosynthesis in order to shade out the competition and claim a greater share of the available water and nutrients. Creating a lighter crown gives you more light and productivity in your ground layer. Finally, there is disease. Pruning is an opportunity to cut out diseases like apple canker and to stop them from spreading. A more open, airy plant is also generally less prone to diseases such as mildew that can attack both plant and fruit. A pruning saw is a double-edged sword though. Carelessly carried out or mis-timed pruning can spread infections or create opportunities for diseases to attack. I generally wipe my pruning tools with meths between trees to avoid transferring diseases. There are three main principles to bear in mind when pruning. Much of the rest flows from these three. The first is that a bud will produce a shoot pointing in the direction that the bud itself is pointing. On a horizontal branch for instance, a bud on the top of the branch will produce vertical growth, buds on the side will grow out horizontally and ones on the bottom will grow down. The second principle is that growing buds suppress the growth of ones further down the shoot. The practical upshot of this is that you can cut a shoot back to a particular bud and this will be the one that will have the most growth. Leaving the end (or apical) bud will give strong extension of the shoot. The third principle is that plants prefer to fruit on some kinds of growth more than on others. The details vary from plant to plant and the biggest differences in pruning strategy are down to this. Raspberries (Rubus idaeus) are often grown up wire frames that support the canes and prevent them from being dragged down by the weight of the fruit. The downside of this approach is that canes that wander too far from the frame are usually pruned off, preventing the natural spread of the plants. Over time this tends to lead to the loss of the whole stand to disease. An alternative approach, which I have now adopted for all my rasps, is to shorten the canes somewhat so that they are robust enough to be free standing. Allowing my plants to wander around the garden has allowed me to make some interesting observations. Raspberries are related to brambles (R. fruticosus agg) and while they don’t share the briar’s trait of making roots at the end of their shoots in order to spread through a wood at terrifying speed, they do share its ultimate dream – of getting up into a tree in order to co-opt its structure and reach the sun. The thorns of bramble and raspberry, like rose, both point backwards from the stem. They are as much about helping the plant to get a grip on the plants that it scrambles over as they are about protection – they are little grappling hooks designed to pull the shoots up into a tree. Grown in the open, raspberry canes grow with a distinctive kink near the top. When they get near a tree, the purpose of this becomes clear: the canes first punch up vertically through the canopy then loop over, hopefully snaring a branch for support. In the open, I generally prune the canes just below this bend. It doesn’t remove too much stem but it seems to be enough to keep them vertical. Under a suitable tree, I just let them get on with it. The pruning is carried out in winter when the plants are dormant. At the same time I remove the previous year’s canes, take out any weak, spindly, damaged or diseased canes and thin out any areas that are too crowded. The old stems make great kindling; new ones go in the compost. The exception to this pruning strategy is for autumn-fruiting rasps, which have to be cut right down to the ground at the end of every season and which generally need some support once they are grown up. Brambles or blackberries are like raspberries, except that their shoots are designed to arch over and root at the tip, which makes them something like a cross between creeping buttercup and barbed wire. However, it’s possible to tame a bank of brambles with a little carefully timed pruning. In the middle of summer, when the shoots are growing at their fastest, cut the new stems in half, at the high point of their arc. If you’ve done the same the year before it is easy as you cut them just beyond where they pass the fruiting stems, so it can be done with a hedge trimmer if you have a lot. The currants (Ribes) nicely illustrate the importance of knowing what kind of wood a plant fruits on. Blackcurrants fruit on new growth so they are pruned by cutting the oldest third of the stems down to ground level every winter, giving a constant supply of new shoots. Redcurrants, whitecurrants, pinkcurrants (all R. rubrum) and gooseberries (R. uva-crispa) all fruit on old wood, so the pruning strategy for them is completely different. Winter pruning is limited to taking out especially old or diseased branches and any shoots that are crossing or growing up from the base. Then, in early summer, all side shoots are cut back to two buds. Because the plants fruit on older growth this doesn’t remove any fruit, but does change the plant’s priorities from making new growth to producing fruit. Leading shoots can be shortened to create a robust, compact plant that will not be dragged down by the weight of the fruit on it. Overall, the aim with redcurrants and gooseberries is to produce an open, ‘goblet-shaped’ plant that allows air circulation and resists mildew. They are usually grown on a ‘leg’ (the stem of the goblet), a short section of trunk free from any shoots. This is particularly useful when you have ground layer crop that you want to harvest and also helps to discourage gooseberry sawfly, which emerge from the ground every year and have to get up into the plant in order to strip its leaves. Apples and pears are pruned in the dormant season, between leaf fall and bud burst. The overall aim of pruning is to produce a robust, compact frame of sturdy branches and short fruiting ‘spurs’ that will support the un-naturally large fruits that we have selected the ancestral apple for. Spurs are side shoots that are kept short (just a few buds). As well as ensuring that the apples are borne close to the main stem this encourages the formation of fruiting buds. The other main aim is to stop the tree putting all its resources into non-fruiting growth. The rule of thumb here is that vertical stems grow rapidly and produce little fruit while horizontal stems grow slowly and produce lots of fruit. As I said above, you don’t want to have to achieve this by cutting off lots of the wrong kind of growth but rather by pruning back to buds that are going in the direction that you want them to in the first place. Before you start, it’s important to learn to distinguish fruiting buds (which will break to produce a spray of blossom, followed by fruit) from vegetative buds (which will produce a length of stem). In the photo below you can see some spurs pruned back to the large fruiting buds. The vegetative buds on the side of the stems are much smaller. Before you start pruning, check whether your tree is a spur-bearer, with the fruit buds closer to the base of the shoot, or a tip-bearer, with the fruit buds clustered at the end of the shoot. Spur-bearers are more common. The first part of the pruning strategy is simple: reduce all vertical shoots to short spurs (or even cut them right back to the branch as they will always tend to want to make vertical growth). The only exception to this is for stems that you want to form the central trunk of the tree in the future. These are generally reduced by about half to keep the tree compact and the stems robust. I generally like to give myself options by keeping a few leading stems at the top of the tree – ones that aren’t needed can be pruned back in the future. Also cut out any diseased wood at this stage. The second part of the strategy is to create a leading shoot at the end of the branch that will give horizontal growth. Pick a shoot (or two) near the end of the branch and prune it back, by about a third to a half, to a bud on the underside of the shoot. This will grow in the direction it is facing, giving a downward-facing shoot (the tendency of all shoots to curl upwards will translate it into a horizontal one). If all shoots on a branch are trimmed back hard then lots of buds will break, setting you up for a dense tree with lots of vertical growth in the future. The end shoots therefore achieve two aims: they give you a horizontal extension to your branch and they produce chemicals that suppress the growth of the buds further down the branch. The photo below shows the result. Right in the middle you can see a shoot that has been pruned back to a downward facing bud at the start of the year, resulting in a horizontally-growing shoot. Finally, the side shoots behind the leading stem are your spurs. Here you can take your pick. Traditonally, spurs were cut back to a short stem of approximately five buds, ending again on a downward facing bud. More recent thinking is to do no more cutting back than is needed to avoid congested and crossing spurs. If the fruit buds are clustered at the tips (a tip bearer), this is definitely the option you need. I’m used to the old way, but will try experimenting with the newer recommendations this year. Avoid pruning stone fruit like plums or cherries in wet weather or in winter as this makes them vulnerable to a disease called peach-leaf curl. A sunny day in July is ideal. Plums do not require a lot of pruning – mostly just cut out any diseased branches and any shoots that are growing vertically or towards the centre of the tree. Summer pruning may involve removing some shoots with developing fruit. Don’t worry about this. Plums always set too much fruit anyway. In fact you might want to thin out the developing fruit at this stage to avoid overcrowding, broken branches and exhausted trees. An alternative to pruning on apples, pears, plums and cherries is festooning – tying down vigorous vertical branches to the hortizontal. This is more work but gives a quick way to achieve a more horizontal structure without removing lots of material and making lots of cuts. I use it, in combination with pruning, on trees that haven’t been pruned for a few years and need some drastic action. If you are pruning a newly planted fruit tree, you don’t need to worry about encouraging fruiting as you shouldn’t allow it to fruit anyway in its first year. Instead, this is the time to think about the future structure of the tree. The traditional advice is to cut the leading shoot of a ‘maiden’ (single stemmed) tree at 75cm and then allow the shoots that come from the buds below the cut to develop into the main branches of the tree for a goblet-shaped structure (removing the topmost shoot if it is too dominant). For access to the ground layer, I prefer to have a little more unbranched trunk than this. Are ‘dynamic accumulators’ a thing? ‘Dynamic accumulators’ are often promoted as an essential ingredient of organic gardening and forest garden design. I’ve planted them myself, but the longer I grow my forest garden the less I find there to be any point to them, so I’d like to try to answer three questions in this article. First, what is a dynamic accumulator anyway? Second, do they work as advertised? And third, do you need them in a forest garden? What is a dynamic accumulator anyway? Let’s start with Wikipedia. According to the entry current at the time of writing, “Dynamic accumulators are plants that gather certain micronutrients, macronutrients, or minerals and store them in their leaves.” The trouble is that there’s a shorter term for this kind of plant. It’s a “plant”. All plants do this so by this definition dynamic accumulators aren’t a thing. Trying to get back to the source of the term, all roads seem to lead to Robert Kourik’s book Designing and Maintaining Your Edible Landscape—Naturally (1986). Kourik included a list of ‘dynamic accumulators’ – plants that he understood to be high in particular nutrients . The purpose of the list was to give some guidance as to what different plants might be contributing to the compost heap and which might be best for producing high-value compost. The trouble is that Kourik himself seems to have disowned both the term and his original list. For more detail, see The Facts About Dynamic Accumulators, an excellent article from the Permaculture Research Institute tracing the origins of the term. Dynamic accumulators, then, rather resemble the monster in Mary Shelley’s Frankenstein. Rejected by their creator, they roam the countryside looking for purpose and acceptance. Have they become, as Frankenstein’s creation eventually did, embittered and malignant or have they, as the monster dreamed of doing, found their own way to becoming a useful and accepted member of society? Let’s move on to how those authors who still use the term, almost all of them in the field of permaculture, define it. Taking a survey of these, three key ideas seem to contribute: hyperaccumulators, nitrogen-fixers and deep-rooted plants. Hyperaccumulators are used in the fairly well established field of biological remediation of polluted soils, in which plants are used to pull pollutants out of the soil, before being cut down and disposed of at a hazardous waste site. As a result there is a reasonable body of research into plants that are particularly good at taking up different nutrients and these have acquired the term ‘hyperaccumulators’. Incidentally, this is the only use of the term ‘dynamic accumulator’ that I can find in the scientific literature. Nitrogen fixing is quite uncontroversial. Some plants form an association with bacteria that allow them to turn nitrogen gas in from the air into forms of nitrogen that plants can use as fertiliser. Most of these are in the massive legume family (Fabaceae), which runs from weedy climbers to great trees. A few, such as alder (Alnus) belong to other groups collectively known as the actinorhizal plants. Finally, plants with deep roots are often proposed as dynamic accumulators, with the idea that they will take up nutrients from deep layers of the soil, otherwise at risk of being washed out of the system entirely, and return them to the surface layers where they will become available to other plants, either through leaf fall or through the gardener actively cutting them for mulch or compost. Some definitions of dynamic accumulators take them to be identical to just one of these groups. Others, including the one on Wikipedia, attempt to ram them together into one concept, ignoring the fact that few plants belong to all three groups and the most popular ‘dynamic accumulators’ almost never do. Is this a case of grouping together ideas that would have much more clarity separately or is there a fuller picture that the all contribute to? Let’s find out in practice. In some places dynamic accumulators seem to be assumed to have almost magical properties. In one blog I read the author expressed confusion at the fact that her crop plants were struggling despite the large and vigorous dynamic accumulators she had growing all through them. It’s almost like trickle-down theory for plants. Dynamic accumulators are imagined to create nutrients out of nowhere and share them freely with surrounding plants. In reality they are almost by definition plants that excel in grabbing nutrients and keeping them for themselves. Whisper it, but another name for dynamic accumulator might be ‘weed’. If we want to put them to good use it will have to more intelligently than this. Using plants as a means of moving nutrients around requires us to ask some questions. Which nutrients do we want to move? From where? To where? What for? However you define them, dynamic accumulators are plants that take up space, light and water. Unless we can give good answers to these questions there is no point in using them. This is why the comparison to hyperaccumulators is misleading on several counts. Firstly, the hyperaccummulators that have been researched so far have been identified for their ability to accumulate problematic, toxic elements, not the ones we want in our gardens. There might be equivalents for the more useful nutrients or there might not be, but in any case the hyperaccumulators so far identified aren’t much use for productive gardening. Secondly, we should remember that hyperaccumulators are used for taking chemicals out of soils. Where there are toxic levels of, say, zinc in a soil it makes sense to use plants that can hoover it up into their tissues in order to remove it from the soil. In vegetable gardening we are trying to put nutrients in to the soil. If we get those nutrients from the soil in the first place then we are merely moving them from soil to plant and back again to no obvious purpose. A futher point here is that you generally want to add the elements that your soil is deficient in – but these are exactly the ones that you won’t be able to accumulate from your soil as they aren’t there. These might seem like rather obvious points but it’s not uncommon to see dynamic accumulators recommended as if they are some sort of fertiliser that simply needs to be added to the soil. Finally, one more problem with the hyperaccumulator model. Most hyperaccumulators are good for just one or two specific elements, but what your plants need is a balance. Things could therefore get very complicated as you try growing a whole range of dynamic accumulators in the attempt to get a balanced nutrient profile. There might not be much room for crop plants. Mike H, on the blog One Thing Leads To Another has put together a list of plants that at least have higher levels of a broad range of plant nutrients in ther leaves than others. Unfortunately it consists entirely of plants – generally considered as weeds – that either very or relatively shallow rooted, meaning that they will only give you back nutrients that were already in the top layer of your soil. The concept makes a little more sense when we consider ways of using plants to move nutrients from places where our crop plants can’t use them to places where they can. One is deep in the soil. The other is the atmosphere. There is a long tradition in farming and gardening of growing ‘green manures’, plants that are grown not for eating but to be ploughed in to the soil like manure to feed a crop the next year. Most green manure plants are in the legume family as they can do what few other plants can – pull nitrogen directly out of the atmosphere and use it as food. The nitrogen then becomes available to other plants when the green manure dies or gets turned in. Green manuring is a well established practice and definitely works. It’s possible to use the term ‘dynamic accumulation’ to describe what’s going on as the plants are definitely accumulating a crucial nutrient in an active way, but does the term actually add anything to the established idea of green manuring? I’d suggest that it simply confuses the matter, conflating nitrogen-fixers with hyperaccumulators and deep-rooted plants. The other place that some plants can access nutrients that others can’t is from the deep soil horizons. I first came across this idea during my forestry degree, reading Forestry Commission research papers (see here, here and here) describing how silver birch improves poor soils by bringing up nutrients from deep soil layers and depositing them through leaf fall on the surface. There are two points here. The first is that absence of evidence is not evidence of absence. The area may indeed be grossly under-researched but that doesn’t mean that we can just dismiss it. I have found plant roots below 1.2m in my garden. They must be doing something down there after all and with herbaceous plants it can’t be about stability. The only explanation I can think of apart from nutrient capture is that they are storing nutrients down below the reach of most things that might eat them, ironically in the reverse of what dynamic accumulators are meant to do! The second point is that deep-rooted plants don’t have to be getting the majority of their nutrients (I doubt if they are) from the deep soil in order to be doing a useful service to the system as a whole. So, finally, are dynamic accumulators any use in the forest garden? Let’s break that down in to its three aspects. First, plants that accumulate particularly high levels of some nutrients in their leaves are of no particular use. They simply take up growing space that would be better used productively. Second, nitrogen-fixing green-manures are useful, but there is no good reason to call them dynamic accumulators. In the forest garden there is the opportunity to plant perennial green manures that are active the whole season round rather than just the usual annual ones. When I visited Graham Bell’s forest garden in the Borders he was growing Laburnum, one of the few nitrogen fixing trees to flourish in Scotland, for composting material. Third, deep-rooted plants may well have a role to play in preventing nutrient loss from the system as a whole, but I no longer see much point in planting anything specifically for this property as so many of the crop plants that you can use do it anyway. This has been my experience many times over with the forest garden. I began by planting some plants for crops and others as hoverfly attractors, wildlife plants and ornamentals. As the garden matured and the range of crops expanded I realised that the crop plants were fufilling all these other roles for free. It is the same with deep rooted plants. Crops like sweet cicely, udo, horseradish, monk’s rhubarb and no doubt many more have very deep roots and are useful for harvesting biomass as well as the desired crop. In fact I have come to think of these species as dual-use plants, providing both an edible crop and compost for the hungrier species in the garden. I do still have a few comfrey plants around, including a clump planted next to my ‘toxics’ compost bin. This bin takes the tattie haulms, brassica roots and any diseased materials. Rather than returning directly them to the soil I just let them break down and be absorbed by the comfrey, which grows at a phenomenal rate and can be cut several times a year. In the future, however, I might replace even this with a crop plant. Apologies to website subscribers who received a post called ‘Donating’ earlier today. This was meant to go up as a new page rather than being published as a post. The news that I meant to put out today is that my 2016 seed list is now on the website as part of a redesign in which the old ‘shop’ page has been replaced by a new one which takes more of a gift-economy approach. You can read all about it at forest garden seeds. There is one kind of plant that really doesn’t belong in a forest garden, and that is grass. When I got my allotment, it had the traditional layout of bare soil beds with raised grass paths between them. The old boys actually seem to enjoy maintaining these structures, mowing the tops to perfection and deploying a range of implements that a hairdresser would be proud of to keep the sides in trim. If this is neglected for even a short while, the grass flops over the sides, first making a perfect habitat for slugs then starting to grow into the beds. I decided that no matter how much work it took to replace the paths with something more sensible, it couldn’t be more work than keeping the things. The turves were dug up and piled, upside-down, to compost. I now have three main walking surfaces in the garden. The short stretch that bears the most traffic is slabbed. The other main paths are all woodchip and across some of the beds I have walking boards. Woodchip is a great path material for several reasons. It is particularly high in carbon which makes it a very infertile medium. Woodchip should never be dug into the soil or, in my opinion, used as a mulch on top of beds, since the soil bacteria pull nitrogen out of the soil to help them break down the carbon, robbing your plants of essential fertiliser. Using it on paths turns its downside into a virtue. If plants do seed into a bed of woodchip, its soft, granular nature means that it is very easy to hoe them off. If you have ever tried to hoe gravel you will understand what a benefit this is. Finally, it is usually a cheap, easily available material. We just get the City Council, who produce mounds of the stuff and are delighted to get rid of it, to drop us off a heap every year. This year’s load turned up last week. To make the woodchip paths, I dug out about a foot of soil and used it to build up the beds. I lined the bottom of the trenches with any cardboard and bits of old board that I could scavenge, but didn’t worry about this where nothing came to hand. Then I simply filled them with as much woodchip as I could lay my hands on. They have to be hoed in the spring and topped up about once a year, but neither job is urgent and they can be done whenever there is time. As well as being much less work, woodchip paths are far more robust than grass ones, something I’m appreciating in the current wet weather as the grass paths are trampled to mud while the woodchip ones show no ill effects at all. Walking boards are even simpler. I only really use them in the annual parts of the garden as there is no problem in stepping on the soil in the perennial parts. They are simply boards laid down on top of the soil to make a path. They serve two main purposes: stopping soil compaction and acting as slug traps. If you turn over any piece of wood lying on the ground you’ll see what I mean: the slugs retire there during the day and can be collected easily. The boards also provide habitat for beetles and centipedes which eat slugs and their eggs, so the slimy molluscs get a double whammy. Here’s the end result. The forest garden has been thoroughly put to bed for the winter, with a mulch of leaves on the growing areas and a new layer of woodchip on the paths. I’ve learned a lot of things in the course of trying out permaculture and forest gardening. Some of them I’ve then had to unlearn again. Here are my top four forest gardening myths. Practically every forest gardening book you can find will tell you that you need ground covers: plants whose main function is to cover the soil. They are usually aggressive spreaders like mint and tansy that also attract insects and are said to benefit the garden in some rather intangible way through the aromatic substances they release. Sometimes they can be plants like Rubus pentalobus, a bramble relative that carpets the ground thickly and produces a token yield of small fruits. I can see where the ground cover idea came from. If you have a large area and are mostly interested in the tree and shrub products, then perhaps all you want from a ground layer plant is that it will outcompete the weeds and save you some work (raising some interesting questions about how you define a ‘weed’). But in a smaller area there is absolutely no point to ground covers: you want to fill the whole ground layer with productive plants and fertility-builders. In my experience ground covers are completely unnecessary for attracting wildlife: the whole point of a forest garden is that the productive plants get to go through their entire annual cycle of growing and flowering and most of them are excellent wildlife plants in their own right. I am also a firm unbeliever in magic ingredients like aromatics in ecosystems: the only magic ingredient is diversity. Funky, curvy lines almost seem to be a defining feature and article of faith of permaculture, which is the route by which a lot of people come into forest gardening. However, at the risk of sounding very… well… straight, I have to say that there’s a lot to be said for planting in straight lines. One reason is that it makes hoeing much easier. There isn’t a lot of weeding to be done in a forest garden, but there’s still some, and running a hoe down between rows is by far the easiest way to do it. It also helps you to avoid hoeing down your crop plants. A lot of perennial vegetables die down during winter and it is very disheartening to slice the tops off them just as they should be bursting into new growth. Having them in straight lines helps you remember at least generally where they should be. Another reason for hoeing is that sometimes you want to thin out your plants, particularly with the self-seeders. I neglected to hoe lines through my leaf beet this year and was rewarded with a patch of scrawny plants that were more interested in producing stem and racing each other for the light than they were in producing fat, juicy leaves for me to eat. Finally, straight lines make for good access. Mandala beds may look great when they are first laid out, but regrettably a New-York-style grid is probably the best compromise between getting round the garden, getting access to individual beds and not taking up too much space that you can get. A mature forest garden is often said to be a ‘no-work’ system. If only! However, there is a kernel of truth in this one. There is far, far less work involved in digging and weeding a well-planned forest garden than there is in an annual veg plot. However, there tends to be more work in the harvesting. With annual vegetables you generally lift the whole plant; in a forest garden you pull bits off it, which takes more time. I would change ‘no work’ to ‘better work’, as I don’t know many people who prefer weeding to harvesting. Perhaps the biggest advantage in work terms is that the the work schedule in a forest garden is much more forgiving. In the veg plot, you generally have to weed those seedlings NOW or you’ll lose them. In the forest garden you can usually leave a task til mañana, or indeed next month, with little harm done. A quick walk round any forest should be enough to dispel this one. You certainly want to keep soil disturbance to a minimum and only those who like thankless work would try to maintain areas of bare soil for the sake of it, but there is no need to obsessively try to cover every square inch with ground covers and mulch. Woodchip is for the paths and the paths only and other, more nitrogen-rich mulches are a useful bonus if you can get them – a way of adding fertility to the soil – not a requirement. Forest gardening is all about growing plants in some degree of shade, and plant books and websites will usually give you a helpful indication of whether a plant prefers sun, light shade or deep shade. Less obviously, the same plant can often tolerate a wide range of shade conditions, often becoming almost a different plant in the process. When I get a new plant to experiment with, if at all possible I plant it out in a wide range of shade conditions to see how it fares. Not all shade is the same: morning shade is different from evening shade for instance, so it’s worth experimenting a bit to see what your plant really likes. I was reminded of another benefit of this approach recently when I found this wild garlic, growing in the most shady part of the garden under the privet hedge that forms my border with one of the gardens that back on to the allotments. 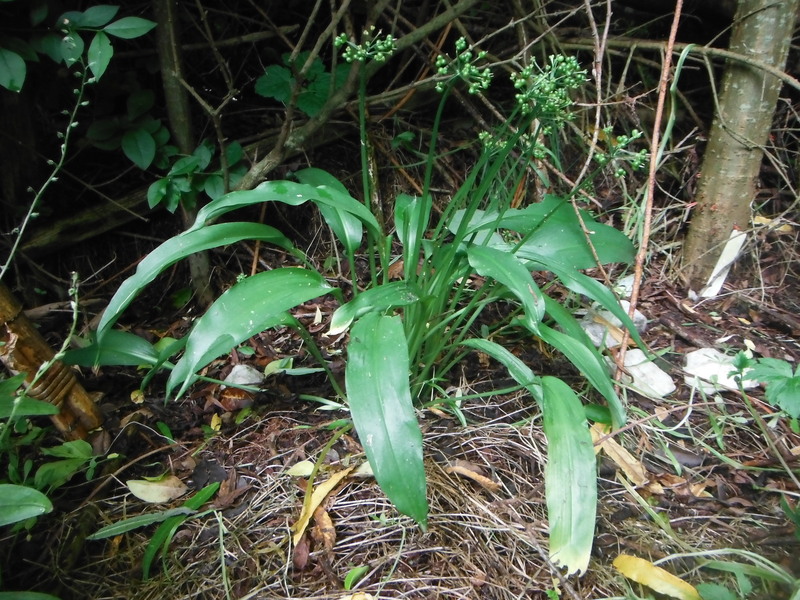 Wild garlic really hates hot sun and most wild garlic round here curled up and died a couple of months ago (which come to think of it, was about the last time we had hot sun). The one in really deep shade, however, has remained in leaf, despite the fact that it has flowered and set seed (you can see the seed heads) on about the same schedule as all the others in the garden. This is quite a common effect of differing shade and you can use it to extend the season of all kinds of plants.